Kansas City’s Middle Blue River Green Infrastructure projects, owned by KC Water, recently received the Institute for Sustainable Infrastructure (ISI) Envision Platinum award. 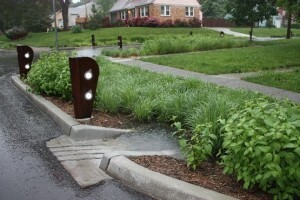 The Middle Blue River Green Infrastructure projects are the 20th overall sustainable infrastructure award from Envision. The Middle Blue River Green Infrastructure projects were designed to reduce combined sewer overflows and improve water quality in the region. The projects were developed in accordance with the U.S. Environmental Protection Agency and a Federal Consent Decree to reduce combined sewer overflows. The project area encompasses 744 acres of watershed flowing to two combined sewer outfalls, both of which flow into the Blue River. 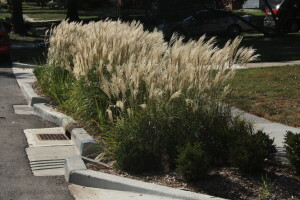 These projects are the first green infrastructure projects for Kansas City’s Overflow Control Program and are the result of a decade-long interest and commitment to the use of green infrastructure by numerous stakeholders, including the Wet Weather Community Panel, City Council, and professional engineers and residents. Quality of Life: Preventing sewer overflows and improving water quality were the primary reasons for the project’s development. The design team implemented an extensive public outreach program throughout construction to identify neighborhood needs, goals and concerns that could be addressed by the projects. Neighborhood priorities that were addressed by the design team included enhancements to sidewalks and curbs, and the implementation of traffic-calming measures to improve neighborhood safety. Extensive street repairs, and in some cases driveway repairs, were also undertaken. Significant buy-in and support for the projects were garnered as a result of the extensive public outreach campaigns and the significant neighborhood improvements that were made. The projects also created recreational capacity for the community, because it contains an existing park. Significant enhancements were made to improve pedestrian access to the playground equipment and basketball court in this park. Also, two additional recreational parks were developed to provide more benefits to local residents. One of the facilities was developed on a site that was overgrown and that was previously used for dumping and other illegal activities. The other site was a vacant lot that was transformed into a wetland with native habitat, trails and viewing stations. The local community where the project was implemented dates back to the 1940s and includes a Park and Boulevard System that was designated a National Historic Civil Engineering Landmark by the American Society of Civil Engineers. The project team effectively preserved this important cultural resource and ensured the overall character of the community was maintained. Leadership: KC Water understood that it would be economically and environmentally friendly to utilize green infrastructure to address wet weather overflows, and the utility knew that green infrastructure would provide additional benefits for residents. As a result, the department demonstrated leadership and commitment to sustainability by working with city officials and other departments and stakeholders to include green infrastructure in the Federal Consent Decree. It is the first decree to do so. The pipe infrastructure, green infrastructure, road and sidewalk infrastructure were integrated to complement each other. Significant infrastructure integration is demonstrated with the project’s collection and storage of runoff, stormwater infiltration that recharges groundwater resources, decreased neighborhood flooding and backups, and reduced stormwater entering the collection system. The project also integrated well with other aspects of community infrastructure, including bus stations, main transportation corridors, planned park improvements, trails, and existing sewer pipes. Natural World: The Middle Blue River Green Infrastructure projects obtained top scores on restorative levels of achievement for its management of stormwater, its prevention of surface and groundwater contamination, and its preservation of species biodiversity. Specifically with respect to stormwater management, the project maintains runoff and reuses it onsite through the use of infiltration, bio-retention, rain gardens, pervious pavement and a variety of engineered best management practices (BMPs). The BMPs provided stormwater runoff treatment that removes pollutants and chemicals such as road oil and grease, pesticides, herbicides and fertilizers from residential users. The project also restores and creates habitat. The addition of parks and a three-acre wetland was designed to provide habitat to a variety of native species. Climate and Risk: The Middle Blue River Green Infrastructure projects were designed to be resilient to the consequences of long-term climate change. The potential issues that face this area include extreme weather events, including droughts and significant rainfall. As a result, the design team incorporated natural systems that utilize less energy than traditional gray approaches, native plants that respond well to change, multiple decentralized systems, and reliance upon more than one technique. For more information on the project, visit KC Water’s website or YouTube.